Available Sizes/Colors: Size "X-Small (0-6 months)" "Small (6-12 months)" "Medium (12-18 months)"
Your little cutie can frolic through the forest (okay, maybe it will be more like crawling or toddling) to Grandmother's house in this sweet Little Red Riding Hood costume for infants and toddlers! 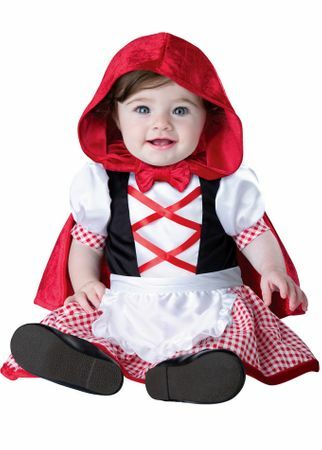 The one-piece body suit features a fairy tale-style criss-crossed satin bodice with white puff sleeves and red gingham trim, attached red gingham skirt with velvet trim, attached white apron. 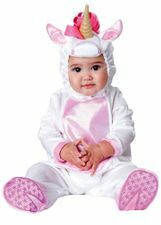 Under the skirt, the body suit is red with snaps at the crotch for easy diaper changing. The soft red velvet hood includes an attached hood and closes with a Velcro closure under the chin. Makes a great brother and sister costume when paired with a Big Bad Wolf costume from our Red Riding Hood Costumes department!